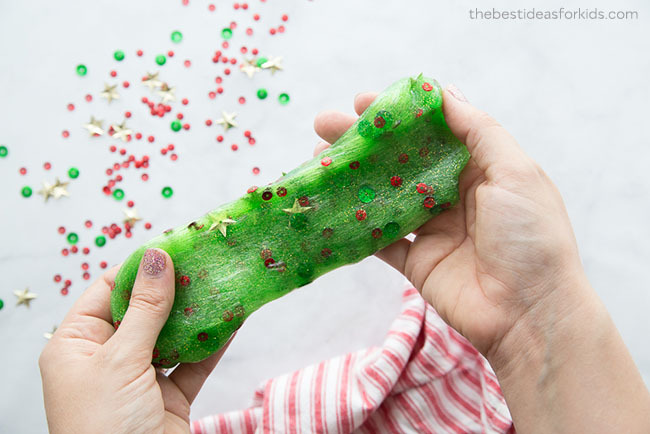 Christmas Tree Slime Recipe – Serendipity <3 ! 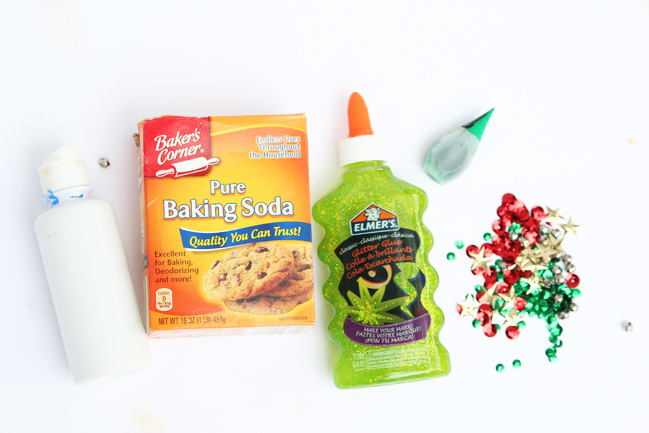 – 1 Bottle of Elmer’s Green Glitter Glue (6 oz). Do not substitute with any other brand of glue because the ingredients may not be the same and your slime might not work! – 1½ TBSP of Contact lens solution. **Important: your brand of contact lens solution must contain boric acid and sodium borate. See our full contact solution slime recipe for the brands we recommend. Safety Tips: Adults only should make the slime and handle all chemicals. Do not substitute any ingredients in our slime recipes. If you have sensitive skin, wear gloves while playing with the slime. Always wash hands before and after use. If you notice any skin irritation discontinue use immediately. See the bottom of the post for more safety precautions. Watch our full tutorial video here before you get started! 1. 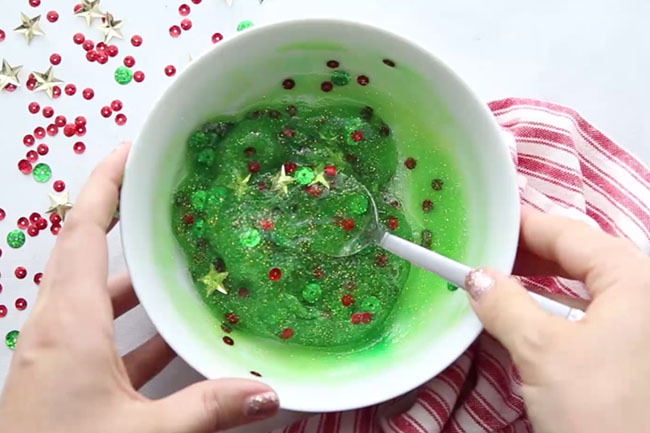 First, add your bottle of green glitter glue to a bowl. 2. Add in your baking soda and water and mix. 3. Now add in any sequins, glitter or stars to your slime. Note: don’t add too many of the glitter stars for little kids as these can be quite pointy and sharp to touch. We would recommend only using a few to make your Christmas tree. You can add them on top of the slime and not mix them in. 4. Now slowly add in your contact lens solution. Reminder: your contact lens solution should contain boric acid or your slime will not form. Add in a 1/2 teaspoon at a time and mix in. Knead and mix thoroughly before adding more as you do not want to add too much or your slime will get too hard. You may not need the full amount so take this step slowly. 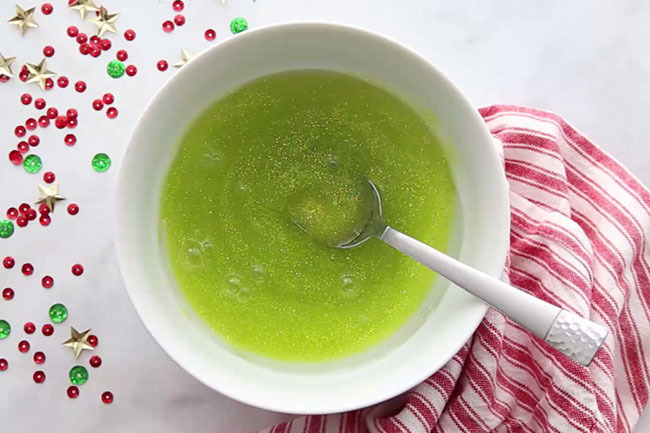 If you find the slime to still be too sticky, add only a 1/2 teaspoon more at a time. Most of the time if you keep kneading your slime it will become less sticky. Now it’s time to play with your slime. Stretch it and turn it into a Christmas tree! – 1½ TBSP of Contact lens solution. 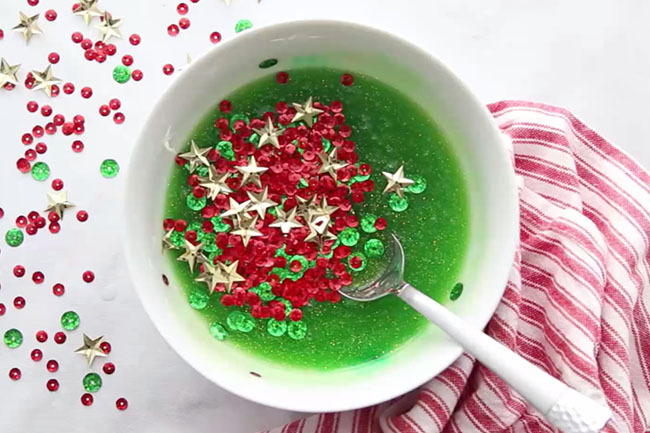 First, add your bottle of green glitter to a bowl. Add in your baking soda and water and mix. Now add in any sequins, glitter or stars to your slime. Now slowly add in your contact lens solution. Reminder: your contact lens solution should contain boric acid or your slime will not form. 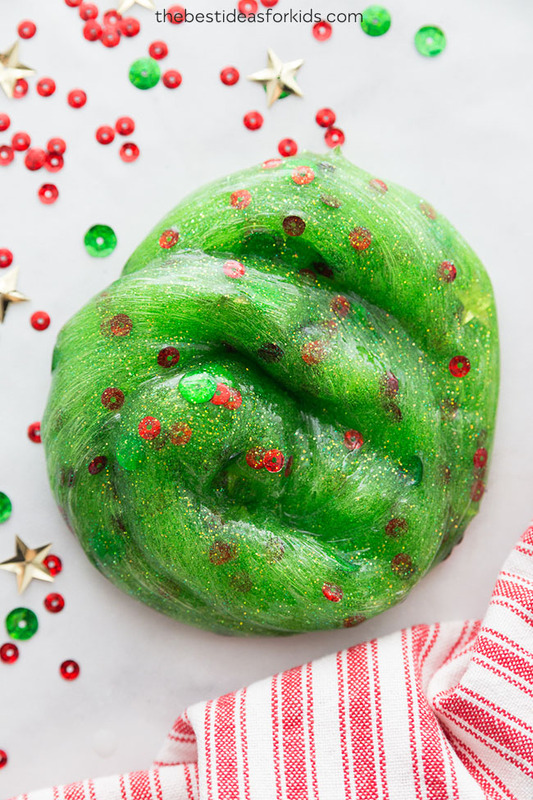 Add in a 1/2 teaspoon at a time and mix in.Knead and mix thoroughly before adding more as you do not want to add too much or your slime will get too hard. You may not need the full amount so take this step slowly. 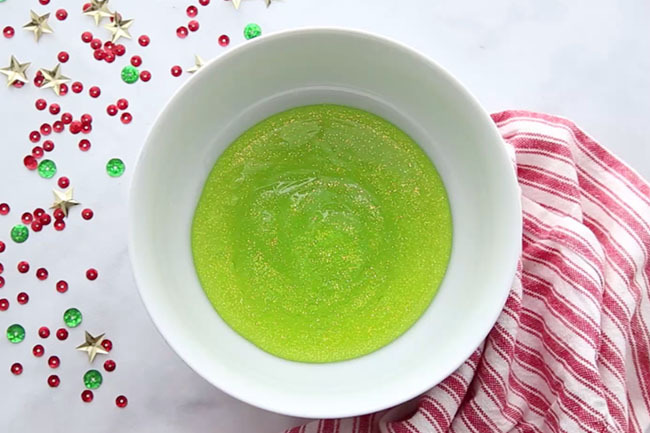 If you find the slime to still be too sticky, add only a 1/2 teaspoon more at a time. Most of the time if you keep kneading your slime it will become less sticky.